There are many achievements a mother can parade on their wall by just being a mom, I realised. Like for example, the successful story of latching on their babies for breastfeeding, the success of nappies changing in the middle of the night when their little one decided to give them a wee fountain surprise, the success of making their newborn stop crying. And as time goes by, I'm pretty positive there are more where those achievements came from. Like in my case, I had to stay in the hospital for 4 days. I bleed before and throughout my contractions and since it the pain was excruciating. Contraction was every 2 minutes and yet dilation was in micro mini scale. Oh God. I took 2x painkillers, 2x pethidines (super sleepy to a point I was hallucinating), 1 hot bath (doesn't really works) and uncountable amount of injected epidural. Hah!! I could say I'm a labour pain-relievers expert on how they felt now. The last one, the epidural was the best invention in my case. It works really well for me at 4cm dilation and I slept like a baby for a good few hours. Although mine was a normal labour, the process was so long it adds up to 36 hours. Thank goodness I didn't take water birth. There were a few complications here and there with the baby and my body not wanting to dilate. So in the end they had to induced my labour with drips. So yeah, Imagine I had 2 drips in my left arm for induction and water drip for the epidural. I had the catheter hanged at my bladder and a small injected tube at my spine. Still I slept peacefully - First achievement. Then at 10cm, come the pushing part. Oh my god the pushing part. No words can describe how energy- drained it was. Although I was on epidural I could still feel the huge pressure and the urge to push. Today's epidural wasn't like the old days where everything was numb you can't feel a thing. This one was in lower dose hence I can feel the contractions but without pain. And because of that in 20 minutes I felt the baby's head coming out. It wasn't long, a good 25 mins the baby is out! - Second achievement. Since it was a 36 hours labour, my uterus decided she's too lazy to contract back so I had postpartum bleeding and I lost about 1.5 litre of blood. It became an emergency case and another drip was injected on my right arm. By this time my movement was so limited I feel I could become robocop anytime now. And every needle poked, there's blood coming out. Forget how scary I was with needle, I was very generous with my blood somehow. All that and after a week, my most dramatic achievement (I thought) was being able to open up my bowel. Yes.... with the stitches and countless iron tablets taken, it was the scariest thing I had to go through. No kidding, though it doesn't hurt as much, I was being a drama queen. But I just can't help myself. Here I am after a month and with delight, I introduce you my most biggest achievement (is it the 10th? ?, ahh...why bother) by far in my life - Say hello to baby Wildan Aali Fairuz. Congratulation on your 10th achievement!! Your experienced is exactly like mine cuma I had 41 hrs of labor and 7 days stay at the hospital. I loss 4 pints of blood. Memang penat la. Dengan kena iron tranfusion sume. I tried all the birthing method ada kecuali hot shower. Don't start on the bath tub haha. Apa yg I frust, I had epidural taken masa I was 9cm dilated. I would've go on tanpa epidural tapi nak move forward ke 10 tu tersangat lah slow. So with the 3rd degree tear I had, for second pregnancy ni I can't go back to the birth centre lagi. I had to had my check up dekat main hospital and by 32 weeks doctor will decide whether I should go for csect atau tak. Dengan baby's condition, lagi la pula kena transfer ke bahagian org bermasalah hehe. Congrats. Baby Wildan is so schute! Sis Hana, congrats on your newborn!!! Yes, being a mother is a great achievement. Congrats Hana! ive been waiting for your updates. Happy breastfeeding! berapa lama cuti ? Asalam alekum, I was only checking your blog earlier today thinking wonder when she will post the pictures of the baby and hope everything went well, and now its appeared on my blog roll, congratulations to you and your family your baby is gorgeous and his name is really nice, what does it mean ? Awwww.. you really brought tears to my eyes. Ya Allah ! Comelnya dia. Alhamdulillah, congrat sis. Welcome to the world of motherhood. To Wildan Aali ! Aunty doakan agar menjadi anak yang soleh .. Amin. Congratulations Hana! Labour pain is 'wordless', however we should thankful to Allah the Almighty for this opportunity-to be a MOTHER. Happy motherhood & happy bonding. Congratulations! He's such a cutie. so cute!congratulations to both of you.May Allah blessed the whole family,insyaAllah! Masya'Allah such a beautiful baby. No surprises though looking at mommy and daddy! Make more babies!! Heee. tahniah hana. been waiting for this post. welcome to motherhood - the best thing that could ever happen! subhanallah-what a scary experience! Stay strong! And your baby is beautiful mashallah! May Allah bless your family! Salam kak hana..congrat for your beautiful baby..just like his father..hehehe..and I'm so glad to hear from you again here..take a good care of yourself..
Congratulations to both of u n welcome to the world handsome ! wow you got through a lot, but you have the sweetest reward now. 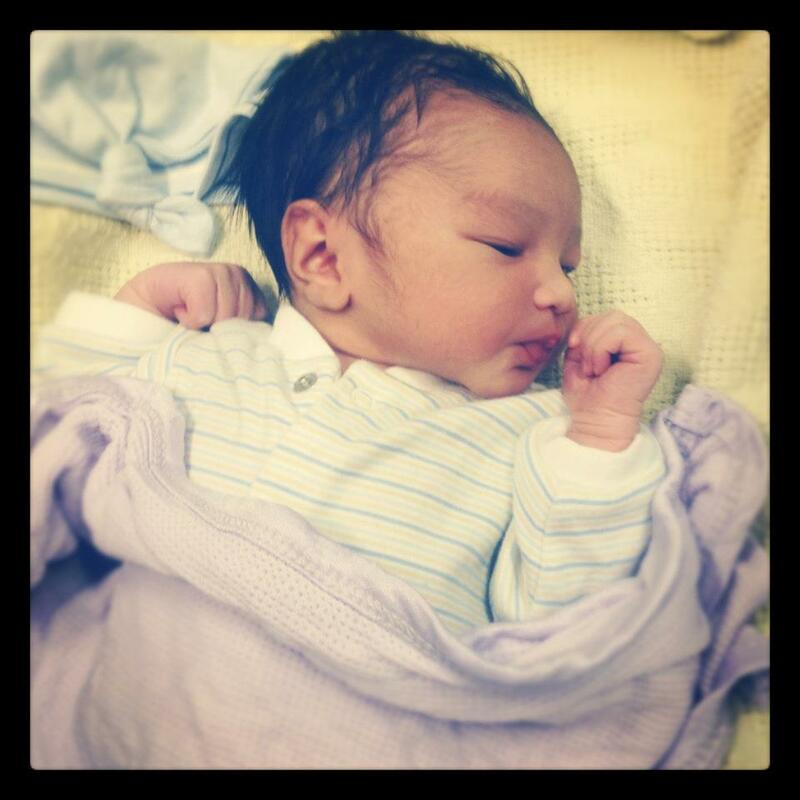 aww hello baby Wildan Aali Fairuz, you're so cute mashaallah! c0ngrats kak hana! ^^ he so cute! Everyday I wait for this post! and yeay! Congrats Kak! Hi dear, it's such the longest labour experience I've ever heard but i am sure it's gonna be very memorable and you'll be missed to get pregnant again after 2 years or shorter?. hihihi. Baby Wildan is a very beautiful baby boy. Masya Allah! I pray that you'll be all cool in handling your study, being a mom and always a sweetheart wifey. Amin. I am so very happy for you and your family!!! So proud and humbled by all your wonderful achievements!!! My prayers are with you and your family, may you be blessed with good health! MasyaAllah, hebatnya dugaan nak bersalin yer. But congratulation for being the tough lady. Its never easy but in the end.. to see the lil khalifah is just miracle right. I hope u are well now..
hugs to ur lil one. He is absolutely adorable, MashAllah. May you have many more achievements and blessings come your way Ameen. it's my first comment here :), i do like your blog. I just wanted to say to you : congratulations for your baby !! Congratulations sis!! I've been waiting for your update. I am your silent reader for a very long time. nervous gak u tak update2 blog. Alhamdulillah everything is fine. MashaAllah he´s so beautiful. CONGRATULATIONS to you and to your husband, May Allah bless you all and give you a good life. tahniah hana'...pengalaman berharga seorang ibu! dan nama Wildan AAli tu sangat soothing! congratulations being a mom already. the baby is super duper cute same goes to his mom. may you and your family be bless by Him. insya-Allah. CONGRATULATIONS! been waiting your update ('m yr silent reader). Alhamdullillah semuanya selamat. Alhamdulillah, it's a normal delivery. I think if you gave birth in Msia harus you will be straight pushed to the operation theater. It's your first baby. Your body was so new with the contractions etc. Enjoy motherhood. And may you have speedy recovery. And you have named him with a good name, that is another achievement ;-) May he become anak yg soleh. salam hana... u have a cute baby boy :) congrats for being a mum :) its wonderful to know & read about other people's story of giving birth... it's just make me feel want to get pregnant again hehe..
tahniah! baby sgt comel=)=).....follow here=)..klu de mase visit me back..
very cute lah - congratulations!